1. 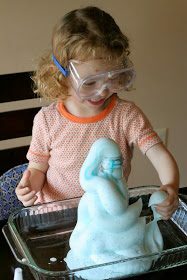 Elephant Toothpaste Science Experiment. 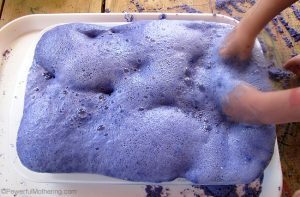 Sensory fun isn’t just for the little ones – I’ve got a couple of kids a bit older who would find this a blast. Ingredients needed: Safety goggles for your child if they are going to be involved in any mixing/pouring, dry active yeast, warm water, 6% Hydrogen Peroxide (available from Amazon), Dawn dish soap (do not use antibacterial versions of soap as Triclosan – what is added to make a soap antibacterial – should not be involved in this reaction), funnel, narrow-necked bottle, Colorations Liquid Watercolors or food coloring, glitter. 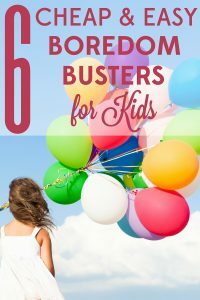 Complete instructions from Fun at Home with Kids. 2. 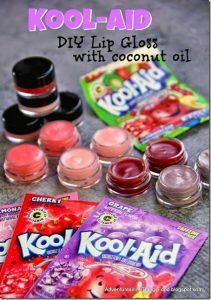 DIY Kool-Aid Lip Gloss For Kids. What little girl – or big girl – wouldn’t love this? Best of all, these are easy to make and only use 3 ingredients. You need: coconut oil, sugar and powdered Kool-Aid (the sugar is necessary to counteract the sourness of unsweetened Kool-Aid powder). Idea and complete tutorial from Adventures in All Things Food. 3. 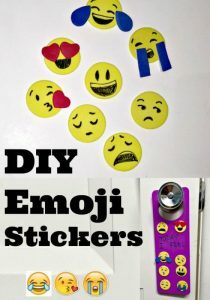 DIY Emoji Stickers. My daughter loves emojis, so we’re definitely trying this craft tutorial from Dollar Store Crafts. You can find the necessary supplies at your local craft or dollar store. You need: Foamies Tub O’Foamies Stickers – Basic Shapes, Foamies Foam Door Hanger -Basic Colors, Permanent markers, Sharpies, glue. 4. Fizzy Cloud Dough Experiment. This sensory experiment takes 1 cup of flour and 1 cup of baking soda plus 1/4 cup vegetable oil. This clouddough recipe is taste safe for toddlers! From Powerful Mothering. 5. DIY Emoji Bath Bombs. YouTuber Karina Garcia is a big hit with the kids in my house. Her complete tutorial will walk you through this craft – or keep the kids amused just watching her. 6. 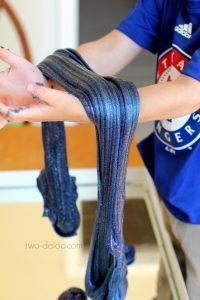 Galaxy Slime. Who doesn’t love slime? Especially one with a night sky theme? You need: clear school glue, Sta-Flo Liquid Starch (available at Walmart), liquid watercolors, fine glitter. Find the complete instructions at Twodaloo.